Join Chase, Rubble, Skye and the gang in a matching adventure! There’s no job too big and no pup too small. 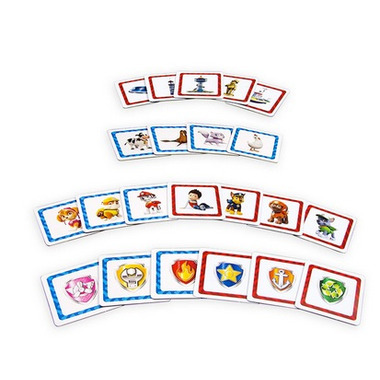 With 72 cards and two ways to play, it’s non-stop PAW Patrol Fun for 2-4 players. Kids can race to find the matches first or graduate to memory matching to see who can find them the fastest. Flip over tiles two at a time. If the pictures match, you keep them and keep on going. Collect the most pairs and you win! Bring home the adventures of PAW Patrol with the Look-A-Likes Matching Game! Join Chase, Rubble, Skye and the PAW Patrol gang in a Look-A-Likes Matching Game adventure! The Look-A-Likes Matching game comes with 72 PAW Patrol pictures to try and match! There are two ways to play! Race to match first, or memory match the fastest! 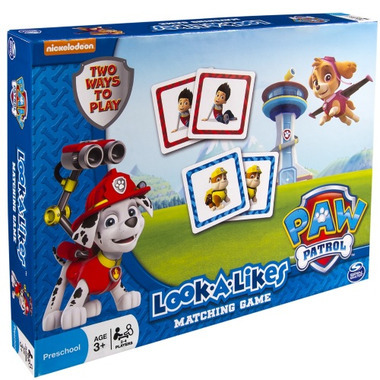 The PAW Patrol Look-A-Likes Matching Game is made for 2-4 players ages 3+. Good quality game. There are a ton of cards to match, so for my 3 yr old I had decided to only set out a few as having them all out was overwhelming for her. It worked as the cards are sectioned out so you are able to use as many or as little as you want. Perfect set-up. Bought these for my granddaughters to play at my house when they visit. They loved it, especially the 3 yr old, she loves anything paw patrol. Cute little stocking stuffer for paw patrol fans!